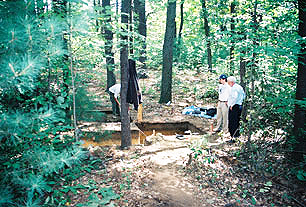 This website was constructed as a tool to learn about archaeology and the artifacts found at the "Pine Hawk" site in Acton, Massachusetts and to learn about the Nipmuck Native Americans who spent time near the site. In the late 1990s, the Town of Acton, Massachusetts comissioned a survey for a plot of land in South Acton in preparation for a new sewer plant. Major state-funded construction projects like the sewer plant require an archaeological survey prior to construction. This survey led to the discovery of thousands of artifacts found at the site called "Pine Hawk" revealing evidence of human habitation extending over 7,000 years. This photo on the right shows the first test pits at the site. Notice that the work was being done systematically and a coordinate grid of squares has been laid out. Very early on, the archaeologists found projectile points and flakes. They soon understood Pine Hawk was going to be a very significant site. Please send comments and questions to the web developer, P. Kotyk at pkotyk@mail.abschools.org.